The birthplace of the Venerable Bede, Sunderland has been a city of culture for 1,400 years. Centuries before shipbuilding, centuries before coal, culture and learning was at the heart of Sunderland’s identity. During the 7th century, Sunderland was a centre for artistic innovation with England’s first ever stained glass window created in the city in 647 AD. The work of Bede and his fellow monks gave pride, purpose and identity to the community which grew up around the monastery at Monkwearmouth, rooted in the North East but reflecting, changing and inspiring the world beyond. From the early 18th century Sunderland forged a path as a great industrial town, once the greatest shipbuilding town in the world. Sunderland’s role as a driving force of industrialisation was also a catalyst for creativity and innovation in the city – notably Sunderland was the birthplace of the Victorian inventor Joseph Swan and generated considerable civic pride. Sunderland opened one of the first municipal museums outside of London in 1846. In 1907 the Sunderland Empire was opened – a beautiful Edwardian theatre which continues to attract huge crowds to its programme of world famous hit shows. Whilst in the late 20th Century the decline of shipbuilding and coal had a big impact on Sunderland, arts and culture continued to play a key role in the city’s identity. In recent years Sunderland has attracted attention for it booming independent music scene. 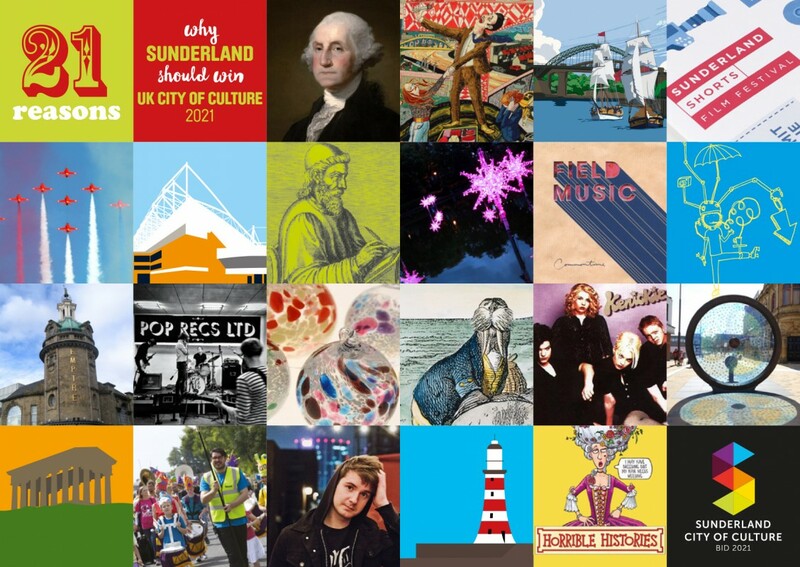 Our visual arts, photography and glass have also built a national profile with Northern Gallery of Contemporary Art, The National Glass Centre and of course the opening of Grayson Perry’s Vanity of Small Differences at the Sunderland Museum and Winter Gardens. Sunderland is not just a city with a history, but one with a great future too. With an array of new developments across the city, from the renovation of the old Fire Station and the regeneration of the new Music, Arts and Culture Quarter, to the restoration of significant heritage sites like Hylton Castle and Roker Pier, now is Sunderland’s time to stake a claim as a city with culture at its heart, and the UK’s next City of Culture.